The best Rocky Mountain National Park games, t-shirts, books and other interesting items are right here, at any of the Nature Stores located around the park. 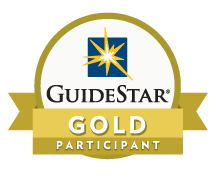 When you make a purchase from our nonprofit organization, proceeds are returned to the park, supporting important educational, interpretive and research programs. Drop by today. 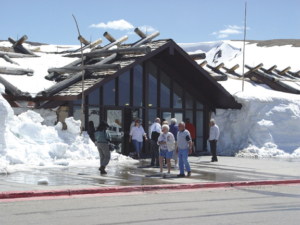 The Alpine Visitor Center is located at 11,796 feet on Trail Ridge Road, at the crest of the Continental Divide. At this elevation it is the highest facility of its kind in the National Park Service. Built in 1936 and followed by several later additions and remodels, this site offers stunning views of Longs Peak, Fall River and the Never Summer Mountains. Test your lungs with a short (but steep!) hike up Huffer’s Hill! Located on U.S. Highway 36 before the Beaver Meadows Entrance Station on the east side of the park. This unique visitor center was designed by Taliesin Associated Architects in 1967, and one of the most significant projects for the firm in the years following the death of its founder Frank Lloyd Wright. It was declared a National Historic Landmark in 2001. 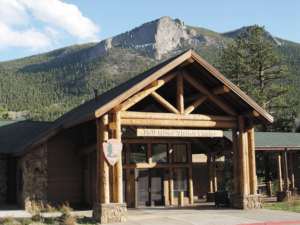 Located U.S. 34, five miles west of the town of Estes Park, this unique visitor center offers a fascinating learning experience with full-size bronze wildlife displays in a stunning facility and beautiful site. More than $2M was raised by the Rocky Mountain Nature Association (now Rocky Mountain Conservancy) for this structure, completed with exhibits in 2000. Located on U.S. 34, just 1 mile north of Grand Lake, this is the only visitor center on the park’s west side. 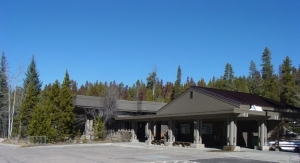 Built in 1990 with about $300,000 raised by the Rocky Mountain Nature Association (now the Rocky Mountain Conservancy), the Kawuneeche Visitor Center boasts exhibits on the plant and animal life of the area, as well as a large three-dimensional map of the park. 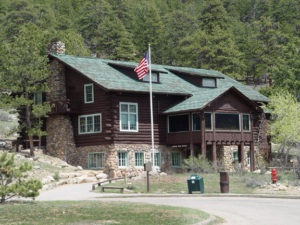 This historic building is located about 2 miles up Bear Lake Road in Rocky Mountain National Park, with stunning views overlooking Moraine Park and Longs Peak. Built in 1923 as Moraine Park Lodge by Imogene MacPherson as the center of her tourist operation, the building was eventually adapted into a natural history museum by the National Park Service. 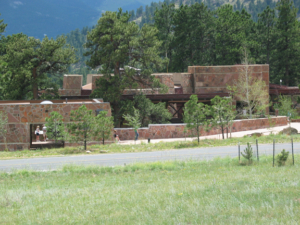 In 1993, with funds raised by the Rocky Mountain Nature Association (now the Rocky Mountain Conservancy), the lodge was converted into a visitor center with exhibits designed by the Denver Museum of Natural History. It features interactive natural history exhibits with themes including geologic processes, glaciation, weather and climate, ecosystems and human impact.